1915 Mrs M.L.E. White (wife of Major Piffy F.F. 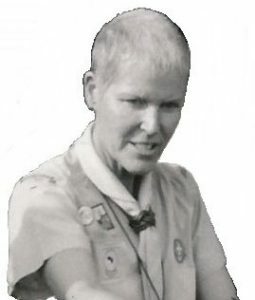 White Scout Master of 7th Cape Town) was the First Lady Cub Master in South Africa and unofficially establish the first Cub Pack 7th Cape Town (Gardens), making this one of the oldest Cub Packs in the World. 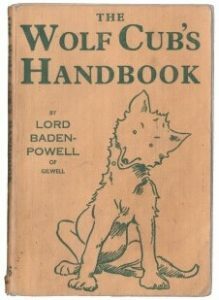 1916 The Wolf Cub section officially starts worldwide and ‘The Wolf Cub’s handbook’ is published as an aid to Pack Scouters. 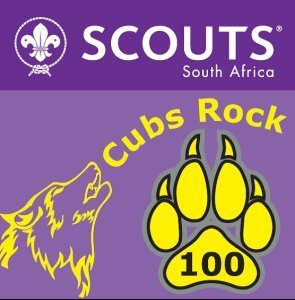 Established Troops from Cape Town to Wellington each now start registering new Cub Packs. 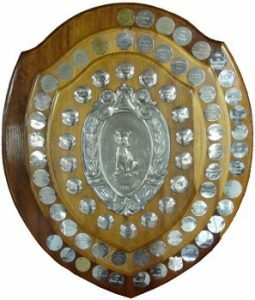 1919 The first Edward Shield annual Cub Competition was held with 7th Cape Town winning for the first 8 years in a row. The Shield was purchased with funds collected to present a gift (but led to purchase of the shield on his request) to Major JP Edwards on his retirement as Provincial Commissioner, and named in his honour the Edwards Shield. 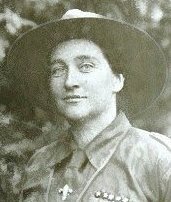 1920 Mrs M.L.E White takes 3 Cubs from SA Senior Sixer M Roytowski, Sixer J. Rutherford and Sixer H. Getz, to the first World Scout Jamboree at Olympia UK where 2 000 Cubs take part in segments of the Jamboree. This is the first and last time (known) South African Cubs attend a World Scout Jamboree. 1921 Rosebank Jamboree 24 May saw Cape West celebrating Empire Day together at Rosebank Show Grounds. Cubs ran side shows for funds and put on displays in the arena including a Cub Trek Cart display race to the delight of all watching. 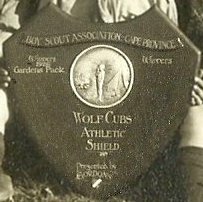 1926 Cub Athletics Shield ran for the first time, donated by ‘The Gordon’s’, a club for boys lacking the advantages of good family homes. Winners were Gardens Pack. The Shield was used to the mid 1930’s, when it ceased to run. 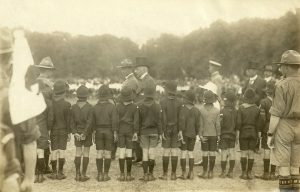 Baden Powell, Olave, Heather, Peter and Betty visit Cape Town for the first time and Cubs put on a Cub Rally for the Chief Scout at Rosebank Show Grounds. Similar Cub participation takes place in all BP’s later visits to the Cape. 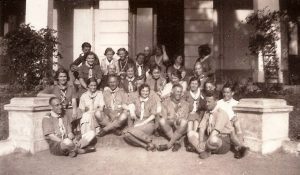 1st Cub Wood Badge Course for Pack Scouters at St John’s Hostel Cape Town, these are later run (from 1928) by Carl ‘Serpent’ and Doris ‘Gilkela’ Rayner on their small holding at Gilcape 1 in Diep River next to the old 3 Arts Theater. 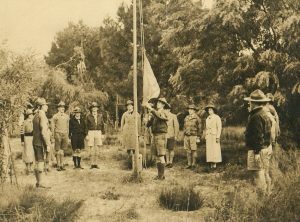 1929 The first Gilwell Reunion at Gilcape 1 Diep River for all Scouters holding the Cub, Scout and Rover Wood Badge, being part of the 1st Gilwell Group in the UK established in 1919. 1937/8 The first South African Cub Palaver, later known as Pow Wow, was held at Bishops Preparatory School in Cape Town. This is a gathering of all Pack Scouters for a few days of relaxing, exchanging ideas and sightseeing together, away from their Cubs. The Pow Wow’s later became a bi-annual event to present day. 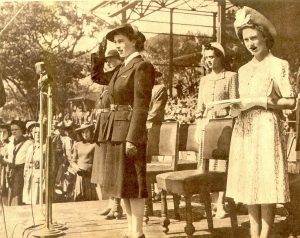 1947 Royal Visit to South Africa by King George VI, Queen Elizabeth l, Princess Elizabeth ll and Princess Margaret. 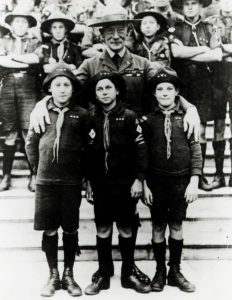 A massive Youth Rally Parade of all Boy Scouts, Cubs and Girl Guides is held at Rosebank Stadium and Show Grounds, followed much later by another massive Youth Rally at Youngsfield Aerodrome to celebrate Princess Elizabeth’s 21st Birthday on 21 April. 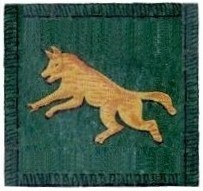 1947 Leaping Wolf Badge award introduced and now awarded to Cubs who have gained 2nd Star and two special Proficiency Badges. 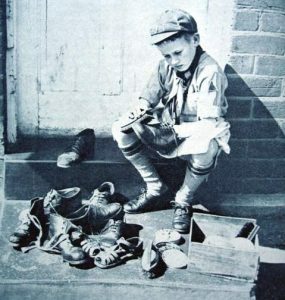 1949 First Cubs set out on Bob-a-Job (doing small jobs for a bob or shilling a job). This continues annually and stops in the early 1970’s due to dangers posed to children in our new ‘civilized’ world. 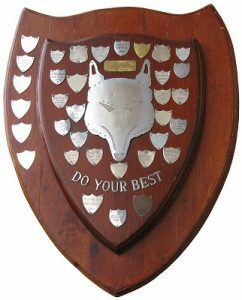 1951 The first Gallant Shield (donated by Mr James Gallant, the Non-European Commissioner for Rovers) annual Non-European Cub Competition was held and won by 5th Cape Town. In the early days of Scouting in South Africa there were separate Divisions for Black, White, Coloured and Indian Scouting. In 1976 the Scout Association, despite the country’s group areas policy, amalgamated all the ethnic groupings into one Scout Association and this trophy ran with the Edward Shield for the smaller Packs to compete for, to eventually combine and stop in 2005. 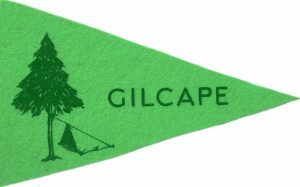 1960 Gilcape Day (initially Arbour Day until 1966) saw hundreds of Cubs assisting Scouts in planting over 2 000 trees over the years at Gilcape 3 Eerste River. The day was generally an open day for displays, tours of Gilcape, exhibitions and some work being put in at Gilcape. 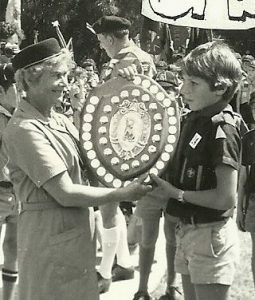 In 1966 this became more Scout orientated with Cooking and other competitions and in 1980 became a combination of the Cape Times Cross Country event and Quinn Trophy. 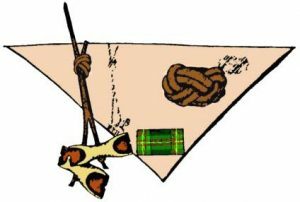 1969 The first Scout Show (based on the old Gang Concert Shows by Ralph Reader) takes place produced by Frank ‘Kudu’ Quinn after months of rehearsals by Cubs, Scouts and adults alike. 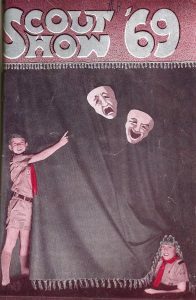 Shows are given in the Southern Suburbs and the Bellville Civic Centre, repeated again in 1971, but alas, with little success of continuation after the second excellent show. 1976 Cub Diamond Jubilee Cubbing 60 years old at Gilcape 3 Eerste River with displays, plays on the Moon landing, fancy dress, fire fighting demonstrations, march pasts and Edward Shield all combined into one huge event. The Chief Scout of SA Charles Martin visited the event for the day to the delight of all. 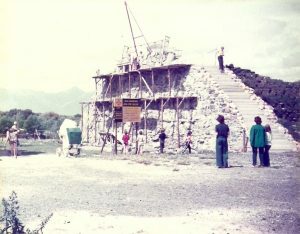 1978 The construction of the Clifford Harris Climbing Wall takes off at Gilcape 3 Eerste River and between start and opening (in 1980), 292 Cubs assist with the building of this gigantic wall of rock 8m high with 300 tonnes of material used. Many good memories. 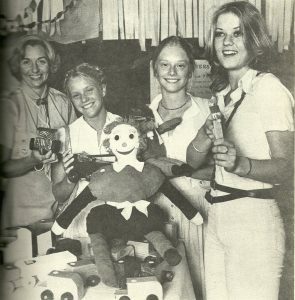 1978 Cub and Scout Toy Making Project driven by Area Secretary Alan Shinton to raise funds for Cape Western. 106 Packs (4 000 Cubs and Scouts) took part in turning out wooden toys, to sell (all under R4 each) in the Strand Street Concourse Cape Town. A whopping total of R1 100 profit was made from this project. 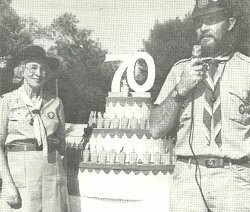 1983 Scout Tattoo (Scouting in action display) in the Good Hope Centre Cape Town saw many Cubs participate in a great well performed marching sequence to the delight of the audience and main organizer Alan Shinton. 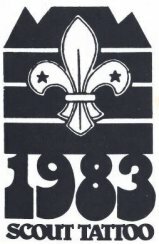 1985 saw 100 Cubs, neatly dressed in red T-shirts with the Scout Tattoo logo on them, giving a mass display of gymnastic exercises done superbly in sequence. Only two Scout Tattoo’s took place under Alan’s guidance. 1986 First Cub Fun Day (combined with Cubbing 70th birthday) at Gilcape 3 Eerste River, with loads of fun events for the day. The Cub Fun Days (not always known as such) were put together by Rene Hawes and later Joyce Horcell and teams. Since 1986 they were not too regular, as over that time we sold Gilcape 3 and bought Hawequas, so many big events shifted elsewhere or faded away. Then 16 June 1999 with the leadership initiative of Shirley MacDiarmid, Cub Fun Day was again ‘officially’ revived and has been held annually every year since. 1998 First Team Scream was held 1-3 May at Geelbek Environmental Centre on the West Coast and initially called “See-o-nee Big Scream”. The Team Scream takes place biennially between the Pow Wow years and was the brainchild of Pauline Keef, giving Pack Scouters time away from Cubs to relax, exchange ideas and build camaraderie. 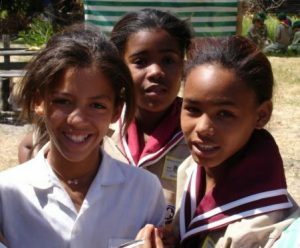 2001 Boy Scouts South Africa opens up to girls in Scouting, allowing girls to join Cubs for the first time. 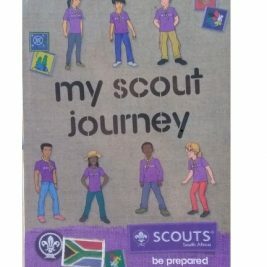 Name changes from ‘Boy Scouts SA’ to simply ‘Scouts SA’. 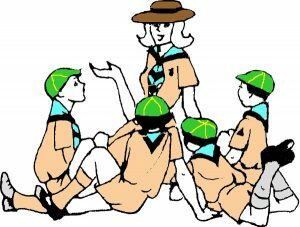 2008 Cub entry age is lowered from 8 years to 7 years, now catering for Cubs from 7 to 10½ years old. 2016 Cub Centenary Celebrations celebrating 100 years of Cubs continue through the year with many various events tying in with the celebrations. Western Cape Heritage Museum sets up a Cub 100 display depicting many Cub memories over 100 years. Compiled by: Western Cape Heritage Museum Research Center 2016. Images supplied by WCHMR. Do a good deed to somebody every day! A good Akela is a person that respects us!